Newbie question here - can a high interest savings account i.e. say 1.9% take the place of Bonds in a portfolio? Why or why not? In terms of giving yourself a buffer or peace of mind in a downturn let's say you have "X" amount of dollars in a high interest earning savings account by which this allows you to stomach a large drop in your equities during a downturn. IMO a HYSA like Ally is perfect for your emergency fund and for storing cash for a near-term purchase (e.g., down payment). A savings account will have a lower long-term growth than bonds and is a different kind of asset, so I wouldn't put it in the same category. Some people might be intentional about doing, for example, 70/20/10, where 20% is the bond allocation and 10% is the cash allocation. If that's an AA you're willing to stick with, it's not a bad one. It depends on what you are trying to accomplish. Bonds will typically yield more but have interest rate risk. High quality Longer term bonds can be negatively correlated with stocks in certain situations like severe economic downturns. Cash in the bank probably won't keep up with inflation. If you are a long term investor bonds are more appropriate. If you may need the money in less than a decade then cash makes more sense. A savings account with 1.9% interest is not likely to give a positive real return net of inflation, so in my opinion it's hard to consider that savings account as an investment. By contrast intermediate-term bond funds currently have SEC Yields in the range of 3.3-4.3%, so seem likely to have a positive real return net of inflation. A savings account is fixed income and does allow for peace of mind in a stock market downturn. Some people do include a "cash" holding as part of their "bond" allocation. A lot of people, including me, base their fixed income allocation on the timing of when they will need the money. I have the fixed income allocation in my IRA in money market, short term (2.5 years duration) & intermediate term bonds (5-6 years duration). I will start RMDs next year. The Vanguard Prime MM Fund is now paying 2.23% interest, can be transferred to your checking account in 1-2 business days (depending on the time of the day you make the transfer) and checks can be written if over $250. For an accumulating investor, a 10% cash allocation probably isn't going to make a difference. For a conservative 30/70 investor in retirement, that is a lot of money to be earning 2% when inflation is likely higher than that, and you could be earning 3-3.5% in bonds. Let's say that you run out of your emergency fund and you are forced to tap into your investment for survival. Would you then start to tap into your Roth IRA and 401K with the Bonds or the Taxable Account with the equities? you are actually selling bonds in your tax deferred but not paying the taxes(only long term capital gains in your taxable account). You might even get to tax harvest some losing equities in the taxable, and buy a (not the same) replacement in the 401k. my fixed income is VG prime MM, synchrony HYS, VG brokerage CD ladder and Ibonds. 1. Rising interest rates will probably cause Bonds to be a worse investment in the near future. 2. High yield savings accounts interest rates will probably increase in the near future. Currently the one I am using is 2%. So my question is if I am using the High yield savings account for the purpose of keeping myself from selling my Equities in a down market - i.e. to "smooth the ride" so to speak than is there anything inherently wrong with that? The rising interest rate only hurts the bond fund share price in the short term. Over the long term, you make more with the higher yield. The NAV price eventually comes back up. Buy when it is down and get more shares. I see that you are 38. So you have plenty of time to invest. In a rising rate environment having a portion of your fixed income allocation in a high yield savings is fine. You have to make sure it is high yield. Most legit savings are paying about 1.9% or a bit more. VG Fed Money Market is paying 2.15 and the Prime Money Market is paying 2.26% -- neither is FDIC protected but are considered very safe. They will also participate in rising rates. The advantage of using VG money markets if you invest with vanguard is that you can quickly move assets from money market to investments and vice versa. Of course the bonds funds will decline during a rising rate environment but they should recover as they replace lower yielding bonds with newer ones with a better yield. So, longer term they should be solid. Let me answer your question with a question: which of these three portfolios would you prefer? Which would you say provided the "smoothest ride"? Okay, so here's the magic. All three are combinations of a stock index (Vanguard 500 Index) with a Vanguard treasury fund of short, intermediate, or long duration over the period 1992 to 2018. It's an illustration more than anything else, since I chose each portfolio to produce EXACTLY the same return over the period so that we could see how portfolios with the same return can have different amounts of volatility or risk. No guarantee this "trick" works exactly this way in the future, but the principle is eternal. 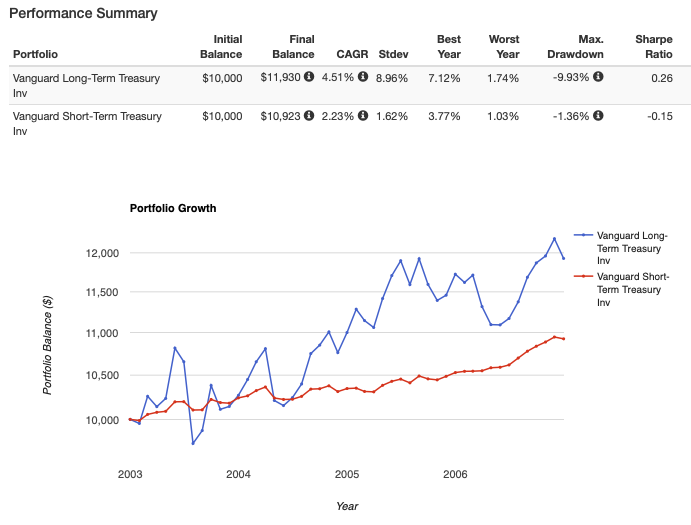 Portfolio 1 is stocks with long-term Treasuries (34.2% stocks/65.8% bonds). Portfolio 3 is stocks with short-term Treasuries (72.26% stocks/27.74% bonds). The magic is that the "riskier" bonds can, when mixed in a portfolio with stocks, produce a much less volatile portfolio. This is counterintuitive, and trips people up. Intuition tells you to buy the short-term bonds to lower the risk of your portfolio, but the truth is the opposite reaction is often the best bet. This is true even in "rising rate" environments, for instance. From 2003 to 2006, the yield on the 7-year treasury went from a low of 2.6% to a high of 5.2%. It effectively doubled. What was the total return of short-term bonds versus long-term bonds during that period of time? This period of rising yields was volatile, but if you were a buy-and-hold long-term investor you came out just fine. The takeaway, I think, is to not worry about "the current environment" if you are a long-term investor. Stick with a long-term plan that is based on reasoned principles, not emotional reactions. The takeaway, I think, is to not worry about "the current environment" if you are a long-term investor. Can you define what's a "long-term investor"? More than 5, 10, 20 years? Generally, I'd say 'longer than the duration of the bonds of bond funds". Most intermediate bond funds have a duration of 5-7 years, so I'd only own them if you plan to hold them at least that long. Long-term bond funds can have durations in excess of 10-15 years. There's nothing wrong with that, but be clear about what you're doing. It's not by any means the obvious slam dunk some people think it is. It is a conscious decision to take lower risk, and almost certainly get lower return, and to do so in a part of your portfolio where risk reduction won't have much impact. b) historically, bonds have moved independently from stocks, and therefore reducing the volatility of the bond part of your portfolio reduces it even less than you'd expect from simple arithmetic that doesn't take that independent movement into account. In my opinion the value and importance of this independent movement is often wildly exaggerated, but it's there. But, yes: bonds and the best available bank accounts are broadly in the same ballpark with regard to return, and if bonds really bother you there is nothing "inherently wrong" with replacing them with savings accounts. But look before you leap. It's not inherently wrong, but it's not obviously right, either. I'm planning to stick with Total Bond and Intermediate Tax Exempt. Closer2323 - In order to give appropriate advice, it's best to keep all the information in one spot. I merged your updated thread back into the original. If you have any questions, ask them here. Sort of off topic but related; are there any “set it and forget it” Vanguard Funds that can be placed in a taxable account? It seems like the TR and LifeStrategy are out because of the bond tax issues. The other option is paying a vanguard adviser .30% for management. I am not concerned about myself but rather if something were to happen and my wife having to worry about rebalancing. VTMFX is probably what you’re looking for. If you’re not in a high tax bracket, the tax drag of Vanguard Target Retirement Income might not be as high as you think. There is also Vanguard Tax-Managed Balanced Fund Admiral Shares (VTMFX) which is very tax efficient. I am currently in a high tax bracket. This may be a dumb question but once you get closer to Retirement and the TR fund is heavier in bonds wouldn’t you be at that point in a lower tax bracket and thus not matter as much? For example if I have a TD of 2045 with a 90/10 stock/bond ratio and the account is $600K how much is that costing me? I have noticed that the advisors that I’ve talked with dont seem to care as much about bonds in taxable.When I asked directly about that they stated the 401K would mirror the Taxable and you wouldn’t necessarily have your bonds in the more tax efficient bucket. What is your opinion of this VTMFX Fund as a set it and forget it option? It doesnt contain International right? It’s basically 50/50 stocks bonds? I think if 50/50 is a reasonable allocation for you that VTMFX is s good fund to taxable accounts. If you have tax-advantaged accounts you could use a more aggressive LifeStrategy fund there to balance things out. The advantages of having a single fund with the right allocation are powerful enough, in my opinion, that I’d personally sacrifice some tax-efficiency to get that simplicity. You’ll probably end up richer in the end. I think you are still better off with "bonds" e.g. 52 week T-bills. A 52 week T-bill does have some term risk but it's mild. The yield is higher than a savings account and it's state tax exempt. VTMFX in taxable and VBIAX in tax deferred make a good pair and a very simple portfolio giving you somewhere between 50 and 60% equity. ER slightly higher at 0.09 and 0.07% compared to 0.04% for VTSAX (Vanguard total stock market Admiral fund) and 0.05% for VG Total Bond. You loose some flexibility for changing asset allocation with the two balanced funds, but if you want to set and forget, I can't think of a better combination.